To apply for a nursing is not that hard as various colleges and universities are offering the program provided that you meet the requirements. If these courses arouse your interest and you have a commitment to become part of the nursing profession, it might be the right career choice. After deciding that nursing is your career, how do you join a nursing program? Although it is competitive to join a nursing school, there are some that accommodate student needs. It is always important that you look at the admission requirements of each school closely and prepare your strongest requirements. You need to have a high school diploma or General Educational Development (GED) also referred to as the General Education Diploma. GED is a set of tests certifying that the taker has attained skills for high school academic level. To pass GED, you must achieve 60% or above of the level achieved by high school seniors. Almost all colleges accept applications with GED diploma or certificate in place of traditional high school diploma. You can use it for your nursing school application like someone with a high school diploma. You need to have good grades for both. Grades vary according to the degree program. Most schools accept grades in the range of 2.0 to 2.75 for ADN programs. Bachelor of Science Nursing (BSN) programs usually set their minimum GPA at 3.0.
schools that have higher demand require applicants to have the highest GPAs. Grades are usually a critical factor when interests exceed the available spots. It usually happens at ADN and BSN levels. It is common to hear of nursing schools turning away students with high GPAs score of above 3.5. Nursing programs still have similarities with other college courses. Different programs emphasize on various things which explain the admission of students with less than 3.0 in the GPAs. It shows that they have other exceptional skills. You need to request a transcript from your high school and any other college you may have attended to show your grades. At some point, nursing schools require applicants to take tests. It could be at the school stage or the program stage. It is important that you read for and take TEAS (test of essential academic skills). TEAS cover reading, English, Science, and Math. The focus is usually on general academic aptitude at ADN level. For example, it can test reading ability at 12th-grade level. When a program has limited slots, TEAS can help you to make the cut if you score highly. It is essential for you to consult nursing schools in your sights about their prerequisites. Although there is no much difference in these subjects from the high school studies, it is important to prepare well. Purchase a reliable study guide, take some practice tests and if necessary, seek additional help. These actions will help you to improve the chances of getting a high score and probability of admission to your favorite program. Volunteer work: It is helpful if you volunteer to do nursing related work at the local community clinic or a hospital. Volunteering helps you to gain experience and enhance your application. It is also an opportunity to know whether nursing would be the right career for you. Hospitals usually have volunteer coordinators to assign the roles for interested persons. If you are looking forward to joining a competitive program, try sticking at the same position for a longer time. It is essential since you will require references by people who know you for a reasonable time. Community service and volunteering always look good to admission committees, especially for BSN level. Be a Nursing Assistant: If your high school grades are low, you can pay to be a Certified Nursing Assistant. This position presents an opportunity to gain experiences that increase your competitiveness. When serving as a CNA, you will work under the supervision of Licensed Practical Nurse (LPN) or RN. Your primary responsibility is to help patients in the activities like bathing and dressing. You also assist in the gathering of patient data and taking vital signs. Some CNAs may get additional responsibilities such as administering medication. To be eligible for a CAN role, you must be at least 16 years old and completed the tenth grade. Most health care facilities require people who are at age 18 onwards and possess a high school diploma. Many technical colleges and some high schools offer a short Nursing Assistant program. You may also start as an orderly or medical Assistant. Both positions do not require a certificate or degree. The responsibilities are limited to helping nurses and doctors but on non-medical care. Eligibility review session: A school representative organizes meetings to establish if a student has met all the requirements. You can find out the specific admission requirements at your chosen schools because they vary from one college to another. Nursing information sessions: It is essential to go for those meetings for orientation about the programs and schools you are applying to join so that you can determine the best one for you and tailor your application accordingly. Now it is the right time to send your nursing program application. Remember to include the transcripts. Worried About Your Success in Nursing Programs? 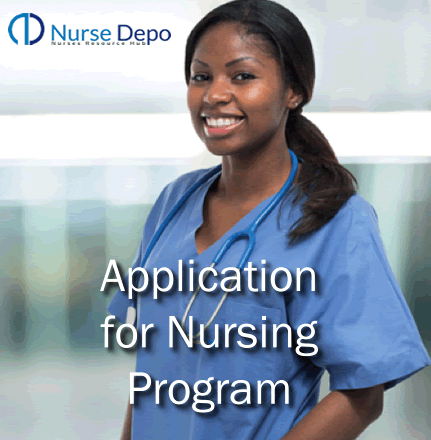 Today Nursedepo.com forms your Partner. Get informed form our training and research on all nursing topics and programs. An Associate Degree in Nursing (ADN) nursing program lets you earn your degree within two or three years after going through a curriculum that includes nursing and liberal arts.  A high school GPA (Grade Point Average) of 2.5 or a GED equivalent. You may also use a college GPA with a minimum of 2.0 with at least 12 college credits.  Chemistry with lab (one year in high school a C or higher or a college equivalent) GRCC: CHM 110 or higher.  Demonstration of competency in mathematics within the last five years.  Health Education Systems Incorporated (HESI) exams. It comprises of scored subtests: reading comprehension, grammar, vocabulary, general knowledge, and math. The passing score for each subtest should be 75 percent or higher. HESI exams are an assessment tool for admissions and also for testing readiness of students for NCLEX exams. It is a computerized exam administered online.  Criminal backgrounds check (CBC) to show your status on whether you involve yourself in crime. It includes the expunged, dismissed or adjudicated cases. Applicants can conduct the process online and submit the evidence including a preliminary background check form to health admissions. A BSN program usually takes four years including classes to a particular nursing major and liberal arts courses for fulfilling general academic requirements. Students who already are Licensed Practical Nurses (LPN) or practicing as an RN are interested in acquiring a BSN can also enroll in a BSN program. Those with RN certification complete the program in two years. High school students can prepare for their BSN early by taking courses in biology, anatomy, and chemistry. The scores for these subjects should be high. They should also fulfill these minimum requirements to join BSN. • Submit high school or college transcripts to show that you completed the relevant subjects for nursing scoring a C or higher. These topics are English, Biology, Chemistry and Math. After completing a BSN program, graduates have to sit for NCLEX exam when applying for Licensure to practice. The program takes 4 years. RN to BSN program is for Registered Nurses, but they do not have a nursing degree. It is a common route for RNs wishing to graduate with a degree for reasons such as improved knowledge, salary and job opportunities. • Special exams: Some nursing schools require prospective students to complete HESI admission assessment test. It consists of math, grammar, reading comprehension, vocabulary and general language skills. Other subjects are chemistry, biology and anatomy/physiology. Accelerated Degree Program is reserved for people possessing a baccalaureate degree in other fields wishing to pursue a BSN. Applicants should meet GPA requirements and other course prerequisites. Prerequisite courses for acceptance include physiology, human anatomy, microbiology, and psychology. Accelerated program of BSN degree takes 12-18 months. Master’s Degree in Nursing builds on a BSN allowing nurses to add their knowledge and develop expertise in a specific area for them to work as specialists such as certified nurse anesthetists or certified clinical nurse specialists. Applicant to MSN program should be holders of a BSN degree from an accredited university or college. Some nursing schools will accept an AND with a Bachelor of Science or Bachelor of Arts Degree in another field. You must present a current RN license regardless of your specialty area. MSN program is for students with a solid academic foundation in health sciences and clinical preparation. Schools may also have other special requirements. For instance, some require students to submit their General Record Examinations (GRE) scores. GRE is a standard test by Educational Testing Services and most top level schools offering master level programs including MSN accept the scores. Some schools waive GRE for students who maintain a GPA score of 3.0 on a 4.0 scale. If you have to take the GRE, register in advance for the result to reach the nursing schools before the deadline. The application is not different from that of any other graduate degree program. Students also submit other materials including a formal application, personal statement, letters of recommendation and current resume. In addition to valid RN license. Some schools require applicants to show some proof of experience in their study area and course requirements in health sciences. If your average point is low, it does not automatically knock you out because the admissions officers for Master's programs consider all the prerequisites as a package. They carefully go through transcripts, letters of reference and clinical work to consider the overall ability. For instance, they consider applicants who want to specialize in nurse anesthetist with upper-level college biochemistry for admission. There are two specialties for Doctorate Nursing Degree Program. You can opt for research oriented Doctor of Nursing Science (DNS) or Doctor of Nursing Practice (DNP) that focuses on clinical nursing. • A BSN or an MSN degree from an accredited school of nursing. You may also submit a Master’s degree from an accredited university in health related profession. • GRE performance results for applicants with cumulative GPA of below 3.4. Admissions officers waive the GPA for applicants with cumulative undergraduate GPA of 3.4 or higher. • Official score for GRE of 300 or higher when a school requires combined verbal and quantitative scores on 130-170 score scale within last five years. Writing score should be 3.0 or higher from the last five years. • A minimum score of 79 for an internet based TOEFL (Test of English as a Foreign Language) and 550 for paper-based if you are ESL student or hold a degree from a non-US university. When applying for DNS, you should submit these documents to show that you have gone through other academic levels. • Official transcripts from an accredited university documenting the award of your BSN or equivalent. • All undergraduate and graduate transcripts. If you have transcripts from non-US programs, you should first submit them for evaluation by a duly accredited credentialing evaluation service. • All you nursing course credit must be from one of the specialized nursing accredited programs. A BSN equivalent will not qualify you for admission without a Master’s degree. • Three references. At least one should be from your peer and another one from the current supervisor. When you make a decision to apply for a nursing program, it helps to research on requirements by different schools and the kind of curriculum they offer. It is also essential that you find information on their cost, schedule and if the subjects they teach fit your career requirements. Most schools organize nursing information sessions for prospective students before admission. Find time to attend these sessions as senior members of the faculty are in attendance to answer any question on the application procedure, program requirement, and curriculum. Gather all the documents you require for your application before preparing your application and when submitting it, ensure that you attach every relevant document. After sending your request and the admissions team review it, start preparing for the tests that the school requires applicants to take just in case they call you. Copyright © 2019 Nursedepo.com. All Rights Reserved.